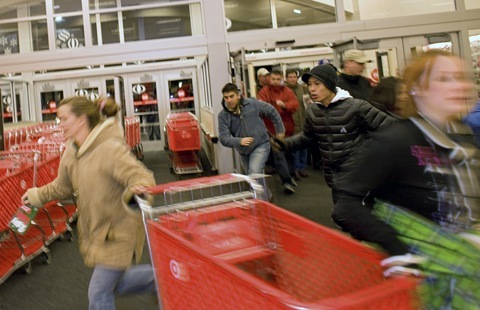 Black Friday: How Much Will Richest Communities Be Willing to Spend? Hoping to cash in on the annual holiday season gift-giving frenzy Toy R Us opened its doors this year at 10 o’clock. That’s p.m. — on Thanksgiving. Other stores didn’t even wait for Turkey Day. If you found yourself walking around whatever shopping mall you live near on Wednesday afternoon, you no doubt saw some of the same sales Patchwork Nation did: — 20 percent here, 40 percent there. There is hope that this holiday season will bring with it a consumer turnaround on Black Friday, Cyber Monday and the days that follow. The belief is that times may still not be good, but they are not as bad as they were. Or that, perhaps, consumers have gotten so used to down-beat headlines about the bouncing Dow numbers, the housing mess, the struggles in Europe, etc., that they have simply adjusted — at least somewhat. A survey of analysts showed they expect November sales to climb 3.5 percent at retailers open at least a year. Looking at our 12 community types around the United States, Patchwork nation feels less sanguine. As we noted earlier this week, in the last few years bankruptcies risen precipitously in the wealthy communities that need to spend to get the U.S. economy moving again. In fact, in 2010, the three wealthiest communities in Patchwork Nation have the highest bankruptcy rates – the Monied Burbs, Boom Towns and Industrial Metropolis counties. Those places hold a greater percentage of the nation’s disposable income than others. The foreclosure problem actually seems to be deepening in the Monied Burbs and Industrial Metros. Both those communities saw foreclosures rise between August and October (more on that next week). And, of course, the abysmal housing report this week offered little hope for a sudden turn-around. If there is hope in this latest set of data, it is that unemployment does seem to be falling — at least a bit. That might help free up some spending. But it is still well above 8 percent in those three key county types. Better, but certainly not great. Of course, a good sale can be a powerful motivator, especially around the holidays when consumerism and gift-giving are very much a part of life. And after a few years of tight budgets maybe people are willing to spend a bit more. But as we all focus on the stories about lines outside of major retailers keep in mind a few things. Foot traffic doesn’t always equal bigger sales. And deep discounts could increase “sales” numbers but still hit at the bottom line of retailers. One of the biggest trends this holiday season is “free shipping” and while it may be free to you, someone (namely the retailer) has to pay. In the coming weeks, Patchwork Nation will be digging deeper into sales tallies and checking in with our 12 communities and community types to see what they tell us. In the end, a bigger bump in wealthier communities is probably more important than the overall numbers. If the Monied Burbs, Boom Towns and Industrial Metros actually see a turnaround in the holiday season of 2010, it may mean the nation at large could see better economic news in the year ahead.